The sunset lighting creates a peacefulness over the coastal town of L'Anse aux Meadows in Newfoundland Labrador in Canada. An old rustic face glows in the sunset lighting in the town of L'Anse aux Meadows in Newfoundland Labrador while the roar of the Atlantic Ocean crashes against the rugged coastal shores in the backdrop. Soft pastel colors blanket the sky as the lush greenery flourishes around the fence bordering the Norstead Viking Site. The coastal scenery from the town of L'Anse aux Meadows consists of sharp, jagged rockery, small islands and the beauty of the Atlantic Ocean. 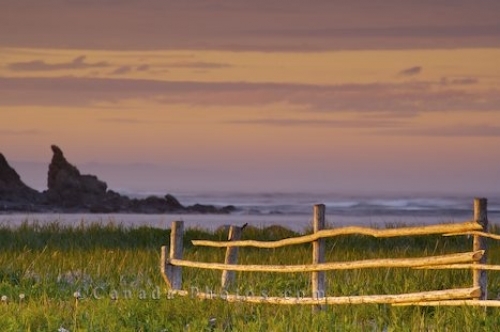 This town of Viking heritage is unique on its own, but the added beauty of the sunsets makes L'Anse aux Meadows the ideal vacation spot. Picture of a calming sunset over the coastal shores of L'Anse aux Meadows in Newfoundland Labrador in Canada. ... aux Meadows at sunset backdropped by the Atlantic Ocean and rugged islands, Northern Peninsula, Great Northern Peninsula, Viking Trail, Trails to the Vikings, Newfoundland, Newfoundland Labrador, Canada.